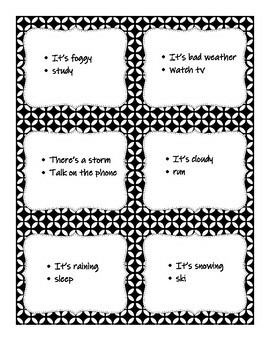 A great, simple activity to practice asking and answering questions in Spanish about weather and activities. File comes with 30 different cards. 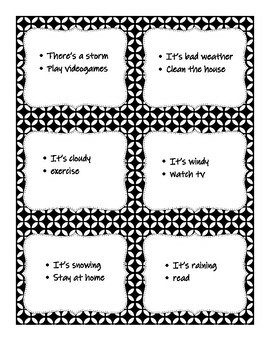 On one side of the card is a weather phrase and activity, and the other side of the card are the questions. Cards can be printed as one or two sided depending on your preference. Please see preview for more information. - Each student gets a card and finds a partner. 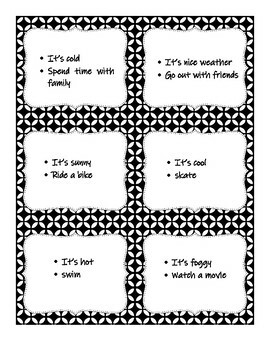 Students then ask and answer questions based on their cards. Students then switch cards and partners. 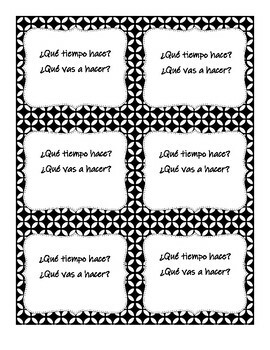 For a more structured activity (and to keep students accountable), time each round and call on a pair of students to read the question and answer. All students then switch and find a new partner at the same time.